The boating capital of the Pacific Northwest offers six miles of shoreline, public beaches, waterfront parks, fishing piers and top-notch restaurants—all within close proximity to downtown Seattle. From stunning views of the Olympic Mountains and gorgeous sunsets on the Des Moines pier to paddle boarding, trail walking, beachcombing and scuba diving, this beach community is great for seeing some breathtaking outdoor sights during your stay. Also, you’ll find a variety of unique eateries and boutique shopping. 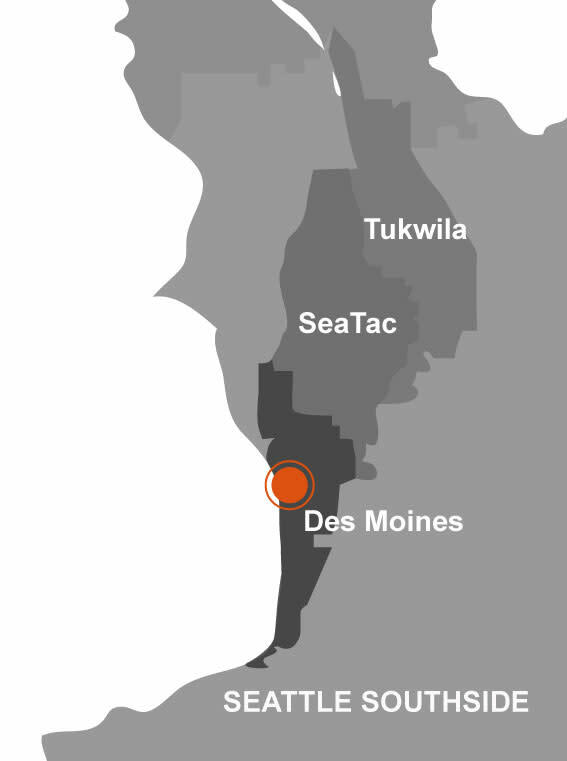 Des Moines is on the eastern shore of scenic Puget Sound, midway between Seattle and Tacoma. The area was homesteaded by a group from Des Moines, Iowa. The beautiful vistas, quiet hillsides and low bank to Puget Sound made it a prime recreation area in the early 1900&apos;s. While recreation and food were the main attractions in the 1920&apos;s and 1930&apos;s, during and after World War II the population grew, and business boomed. This led to formal incorporation as a city in 1959 and the eventual construction of a marina and pier. Today, Des Moines is often called the "Boating Capital of the Pacific Northwest" and is considered among the best places in the North West metro to retire or raise a family. It blends the benefits of waterfront living with the convenience of metropolitan access. The city&apos;s six miles of shoreline offer public beaches, waterfront parks, top-notch restaurants, fishing piers and a well-used boardwalk. It also has a 900 slip, full service marina with 1,500 feet of transit moorage and fuel services. Culturally Des Moines is a paradise with all of the museums, symphonies, opera and theater companies within thirty minutes. Family activities include camping, fishing, whale watching, boating and personal options seem limitless with community sports, skiing, boating, hiking, bird-watching,rock hounding and more. Seattle Southside consists of Tukwila, SeaTac and Des Moines, three hidden gems that have a lot to offer.